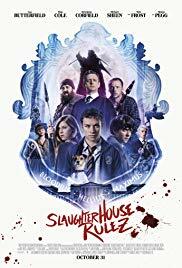 British monster horror comedy Slaughterhouse Rulez, starring Shaun of the Dead's Simon Pegg and Nick Frost is getting a UK Blu-ray release on March 11, 2019. The film is directed by Crispian Mills who worked with Pegg on A Fantastic Fear of Everything. This ancient and ordered world is about to be shaken to its foundations – literally – when a controversial frack site on prized school woodland causes seismic tremors, a mysterious sinkhole, and an unspeakable horror to be unleashed.